Envision yourself enjoying sunny days, white sand beaches, palm trees and the tropics! This is your destination for your disconnect-to-reconnect Yin and Restorative yoga retreat. Decide to deepen your practice in a safe environment while resetting and balancing your mind, body and spirit. Feel free to just bask in the sunshine and relax in a hot tub and resort-style pool. You may also add in some healing therapy sessions of massage or acupuncture. Zen Den Yoga School and Retreats offers you a great experience to relax with plenty of beautiful scenery and activities to explore nearby. You will have access to Wi-Fi, and a state of the art kitchen with Vita Mix and Juicer during your retreat. Bicycles will be provided so guests can explore nearby attractions. Indulge in the experience of Yin and Restorative yoga to truly deepen your practice both physically and spiritually. During your days with Zen Den Yoga School and Retreats, you will gain a deeper understanding of yourself by tapping into the subtle energy body in the poses. You will loosen your joints, clear toxins, and by relaxing the active mind you will find greater ability to connect with your intuition. Within the asanas, you will learn grounding meditations and visualizations to improve health and balance emotions. Zen Den Yoga School and Retreats provides the yogi and yogini with a safe and nurturing environment to grow and practice the yoga lifestyle. They are not your average yoga retreat. They adhere to the true meaning of the word yoga: to yolk or bring in together all aspects of the eight limbs of yoga. Your time of disconnect to reconnect can be enjoyed in sunrise meditations, beautiful yoga practices in the yoga shala or outside on the yoga decks, stand up paddle board yoga along the inter-coastal waterways, relaxing massage and energy therapy, balancing acupuncture session, and topped off with a beautiful tropical sunny weather! What else could one ask for? 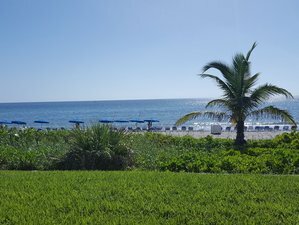 While recharging at the beautiful retreat center in Boca Raton, you are welcome to enjoy daily meditation and yoga classes or even sit in the 200-hour YTT yoga school’s in-depth yoga teachings. At the school, they teach Sadhana yoga, the yoga of spiritual practice and the asana practices of Vinyasa, Hatha, Yin and Restorative flow. Their approach is experiential, contemporary and eclectic. Zen Den brings to life the ancient teachings of yoga through accessible spiritual lessons still relevant today. Ira and his wife Valerie have built an incredible experience offering guests enlightening programs minutes from the ocean. The school offers an on-going 200-hour yoga teacher training program, you can feel free to sit in on these lectures, documentary films, and other school activities. Zen Den Yoga School's belief is that all yoga systems are on the same path, therefore, they embody many traditions of yoga, honoring the diversity of their gurus. You will have the opportunity for guests to join the yoga teacher training students in yoga philosophy classes during the weeks there are school in session, in between their yoga classes. On Tuesday, Ira and Valerie lead Yoga Sutras discussions in Satsang style. Thursdays there is a 7 p.m. Tai Chi class. Satsang occurs when small groups engage in a spiritual dialogue. In Satsang, participants commit to exploring the liberation of truth. It is a formal or informal gathering intended to facilitate the sharing of wisdom and is said to be a particularly important doorway to experiencing inner freedom. We give you the opportunity to detox and cleanse while you are on your retreat, supporting you in have the best experience with meditation and yoga possible. We give you all of your personalized ingredients for breakfast and lunch nutritionally balanced smoothies - They are low glycemic, vegan, gluten free, with a soy free option as well. They boost your anti-oxidants, and alkalinity allowing your body to thrive, you will receive the 1000’s of phyto-nutrients that we know bodies love best! We teach you how to prepare these shakes, and many of our retreaters love them and how their bodies feel so much, they request the recipes to take home with them! Dinners you are on your own and there are a few options. Guests sometimes opt to cook in a state of the art kitchen with Vitamix and Juicer (students almost always do), and there are excellent grocery stores within walking distance. Or, if you prefer, there are also plenty highly recommended multi-cultural cuisine restaurants to choose from within walking and biking distance. Please book your flight to arrive at Palm Beach International Airport (PBI) or Fort Lauderdale-Hollywood International Airport (FLL). Zen Den Yoga School is about 30 minutes from either one and is easily accessible by taxi, Uber or Lyft from those airports. If you sign up for a program less than 30 days away, full payment is due at sign up. Reservations may be canceled if final payment is not received by the due date and cancellation charges will apply. Changes in your plans that affect departure city, cabin categories and / or passport name changes may incur a per person administrative charge or possibly a cancellation charge. If you must cancel your participation in a program, you must do so in writing. Cancellation refunds will be calculated as of the date Zen Den Yoga School receives your written cancellation. Any applicable refunds will be processed 30 days after the receipt of your written cancellation. There is a non-refundable fee of 125 USD per person for each program you cancel. This fee reflects only Zen Den Yoga School’s costs of administering a reservation and is not intended to be punitive in any way.